Tranquil has a talent for building computers that are both eco-friendly and very functional. The T7-330 Atom PC is no exception. This compact little system comes with between 512MB and 2GB of ram, depending on the user’s preference. The available hard drive options range between 80GB to 2TB for the primary drive, with the option for a second drive with up to 250GB of space. The processor is a 64-bit dual-core Intel Atom 330, with a speed of 2×1.6GHz. Operating system choices include Windows XP (Home or Pro editions, with Service Pack 3 applied) and Windows Vista. The combination of the Intel Atom 330 processor and Tranquil’s proprietary TranCool3 heat sink gives the T7-330 Atom a very low power output. 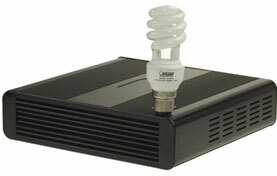 The base model consumes 28W, while the high-end version only pushes that rating up to 31W. The combination of this processor and heat sink also keeps the machine very cool, with a maximum ambient temperature of 48°C, and like all Tranquil products, it is almost totally silent. While the actual power output might be slightly higher than some other eco-friendly machines, few can match the capabilities this computer offers. This combination of low-energy and raw computing ability makes for a machine that is not just eco-friendly, but powerful as well. The T7-330 Atom Low Power PC measures at 224 (d) x 232 (h) x 57 (w) mm, and may either be used as a desktop or mounted on the wall with the optional wall brackets. The base model starts at a price of £196.00.